Sunday afternoon I made a tomato tart. I loosely followed a recipe from Puff, the puff pastry cookbook that SP gave me last Christmas. 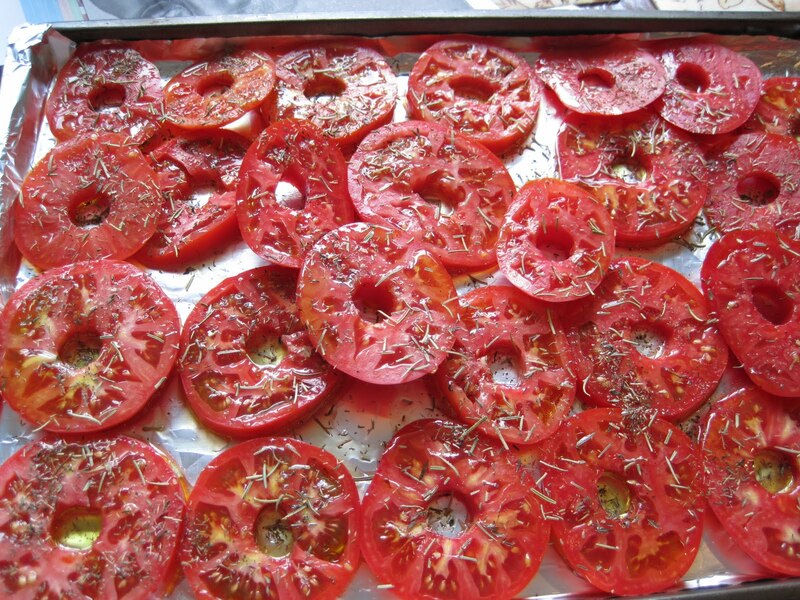 Instead of using plum or cherry tomatoes, I used the tomatoes that SP bought at the farmers market. 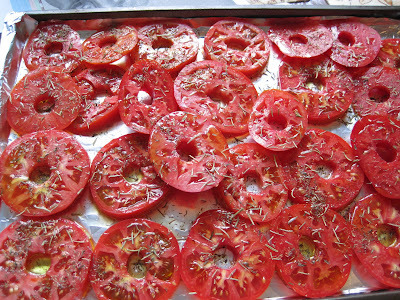 There were 5 tomatoes (we had eaten the 6th one at lunch) and I sliced each into about 5 slices. 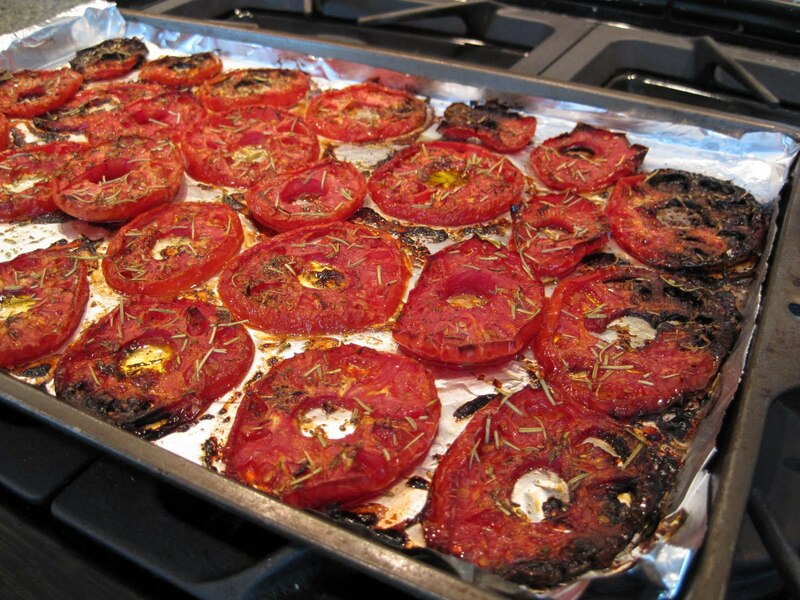 I placed them on a foil lined cookie sheet, seasoned the slices with salt & pepper, drizzled olive oil over the slices, and sprinkled them with dried rosemary & thyme. SP tried to buy fresh rosemary & thyme at the farmers market, but couldn't find any. The herb guy told him that they sell out quickly of those two herbs. Maybe next year we should try growing them since we use them a lot. The tomatoes roasted in a 350 degree oven until they were shriveled (and the ones along the perimeter of the cookie sheet were black!). The official recipe says the roasting can take 1.5~3 hours. I think theses ones took a bit over an hour, but I'm not sure because I was busy doing other things in the kitchen while they roasted. Definitely at least an hour. 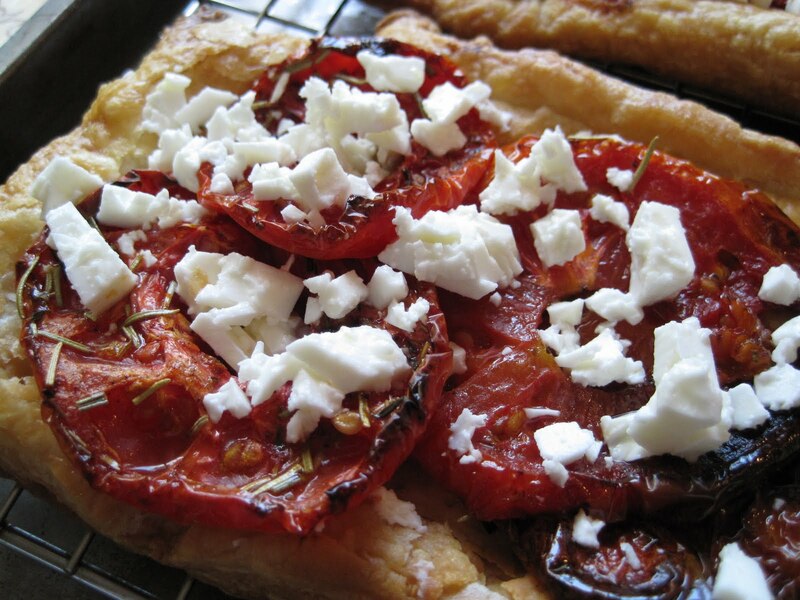 As the tomatoes cooled a bit, we increased the oven temperature to 425 degrees and rolled out a sheet of puff pastry. The official recipe says to roll it out to 14" x 12". I'm pretty sure ours was not that large - we get annoyed rolling puff pastry and never seem to roll it as thin/large as the recipe states. The 14" x 12" sheet is cut in half, each half is placed on a parchment lined cookie sheet, the halves are pricked with a fork, and the pastry is baked for about ten minutes. While the puff pastry baked, I chopped some feta cheese. 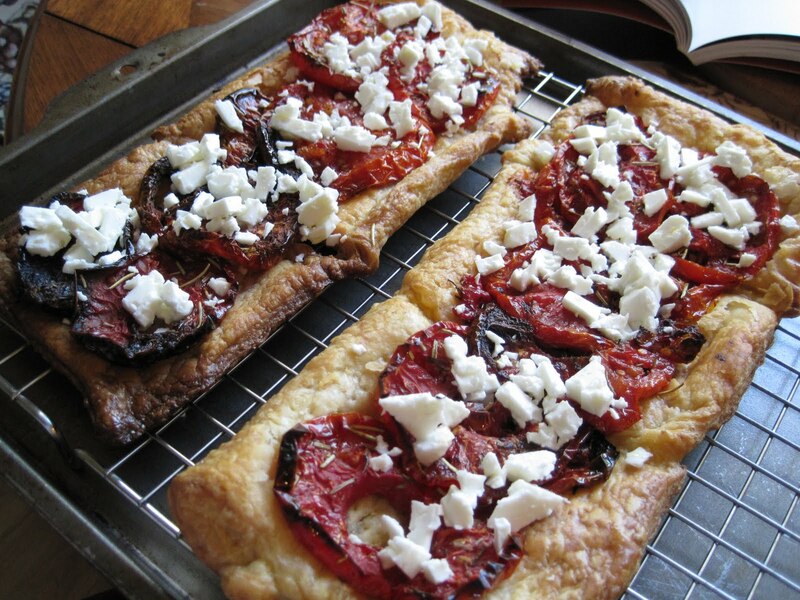 After ten minutes, the puff pastry is removed from the oven, puffy parts in the centers of the pieces are gently pressed down, and the tomatoes are layered onto the puff pastry. Then it's returned to the oven for about 12~15 minutes or until the edges of the puff pastry are golden brown. The cooked and tomato covered puff pastries are then transferred to a cooling rack. The edges are brushed with olive oil and the feta cheese is sprinkled on. 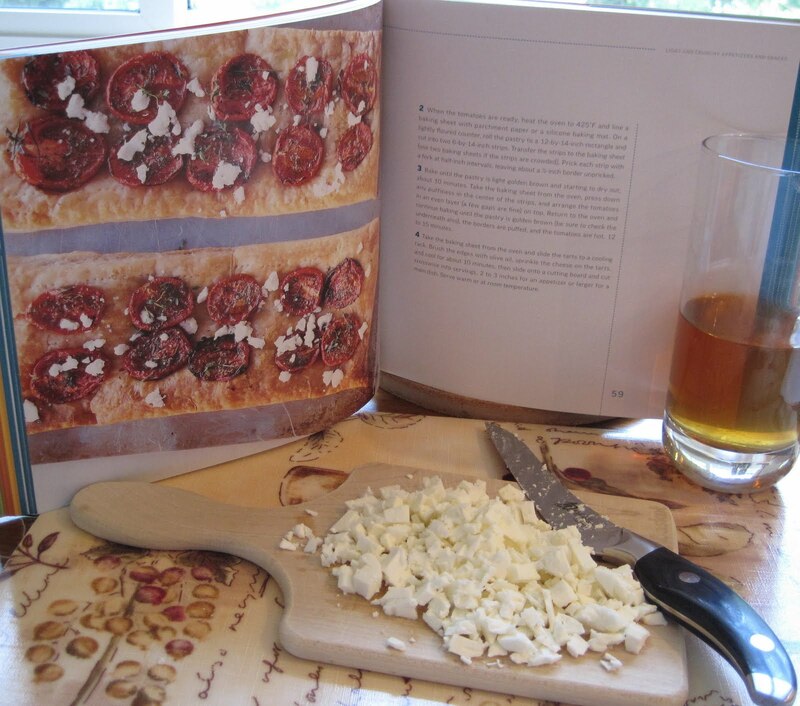 Ours didn't quite look like the cookbook photo (since we used different tomatoes and probably more than 2 ounces of feta). After the tarts cooled for a bit, we sampled some - a little appetizer while dinner was still on the grill. Mmmm this was tasty! I love puff pastry, I love tomatoes, and I love cheese - so it was pretty much guaranteed I'd love the tomato tart. And I did. Very much. We'll definitely make it again. Maybe even this weekend, since SP only got a small piece (I ate 3/4 of the finished product for dinner Tuesday night when he was at a work function).